January always seems to be a good time to go away if you ask me and this year I found some cheap Ryanair flights at only £50 return to Wroclaw, the fourth largest city in Poland and as we had previously been to Krakow and enjoyed it there we quickly the decision was quickly made to visit the historic capital of Lower Silesia. 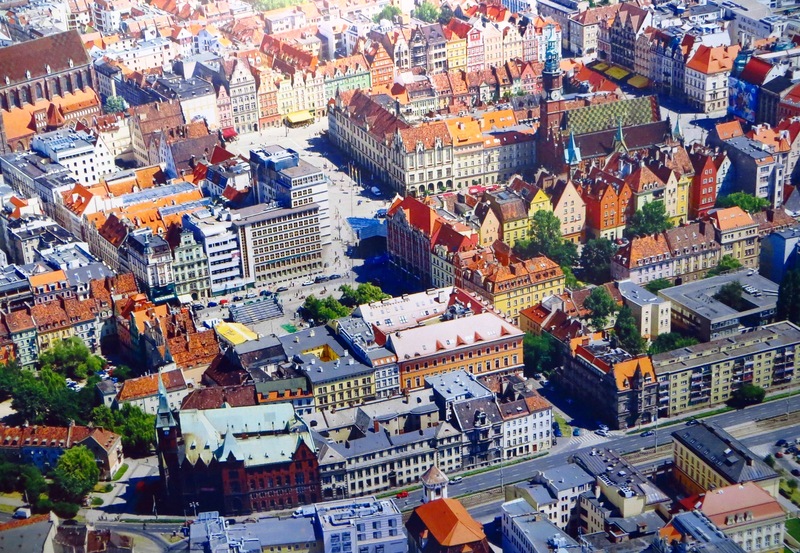 We enjoyed a wonderful weekend in this charming Polish city and enjoyed it so much that we have made arrangements to go to Warsaw early in 2015. Twelve months previously in March 2013 we had travelled to the small town of Sigüenza about one hundred kilometres north east of Madrid on the road to Zaragoza and Barcelona and we liked it so much we decided to return for a second visit. 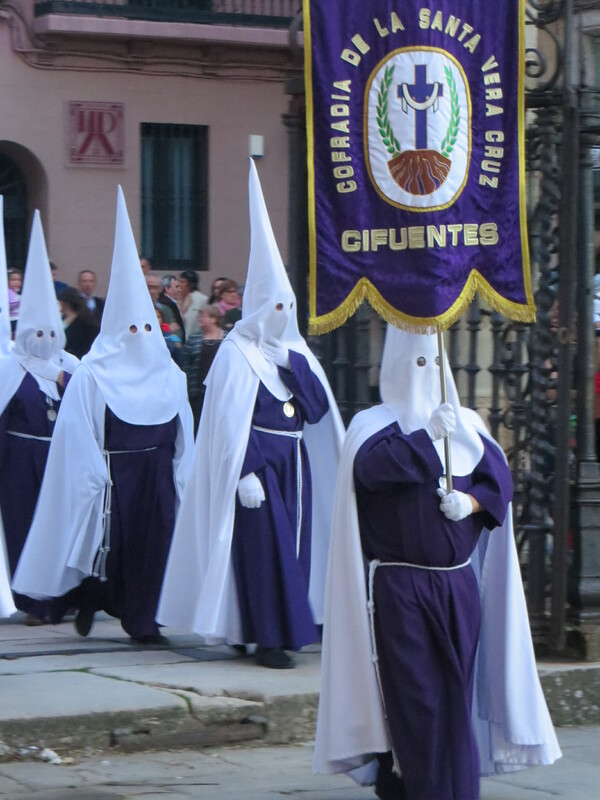 One of the reasons was to see the Semana Santa for a second time. 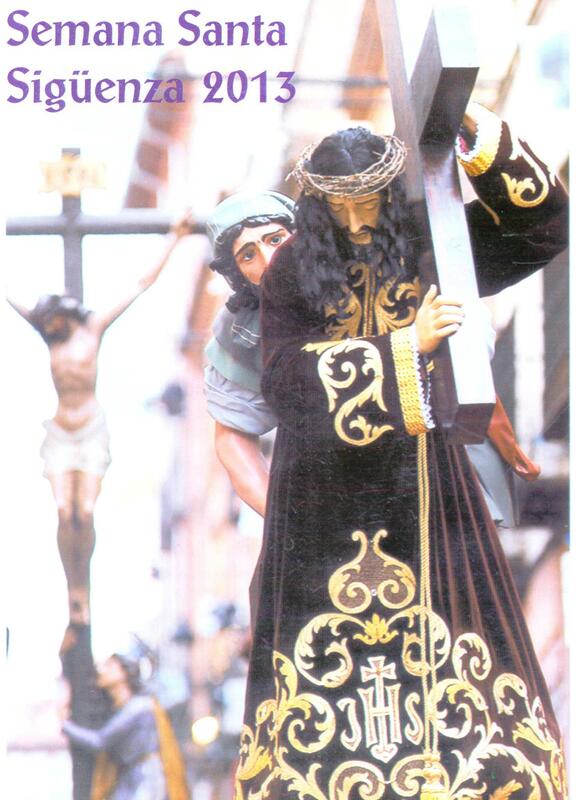 This is one of the most important traditional events of the Spanish Catholic year; it is celebrated in the week leading up to Easter and features a procession of Pasos which are large floats of lifelike wooden sculptures of individual scenes of the events of the Passion. There is a pub quiz question that comes up regularly and which I always get wrong, which is ‘what is the nearest country to the United Kingdom’ and the answer of course is Southern Ireland or Eire but I always forget about the border with Northern Ireland and blurt out ‘France, it must be France’. Not surprising then that until now I have never visited the country. 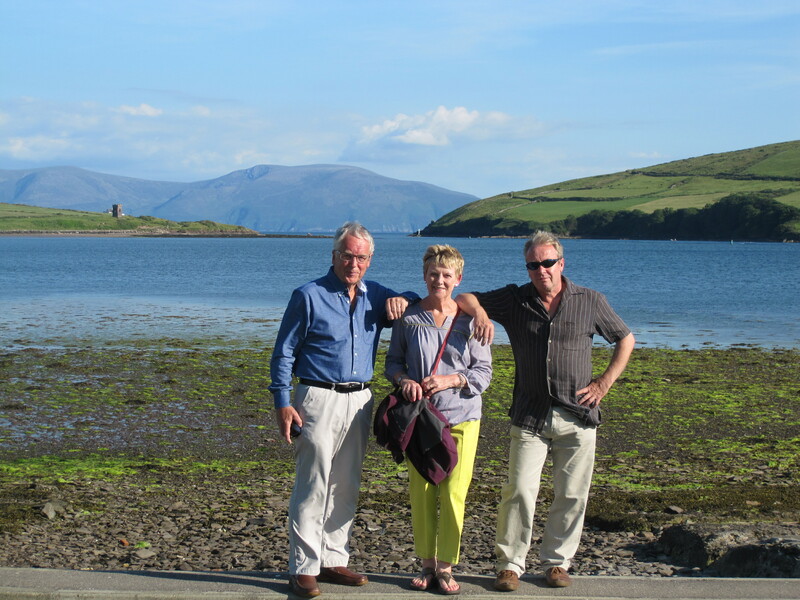 2014 has been a big year for me as I reached the birthday milestone of sixty years and I was planning something special to celebrate the occasion and then some friends asked if we would like to visit Ireland with them and that seemed special enough so we set about making travel plans. In 2004 I celebrated my fiftieth birthday with family on the Greek island of Santorini. On the final night I treated everyone to a birthday celebration meal in a taverna and drank far too much Mythos Beer, Ouzo, and Metaxa Brandy and rashly declared that we would do the same thing in ten years time when I would be sixty. I went to bed and promptly forgot all about it. My children didn’t forget. As 2014 got ever close they kept reminding me about the offer that I had made that night and so eventually I had no option but to deliver on the promise. 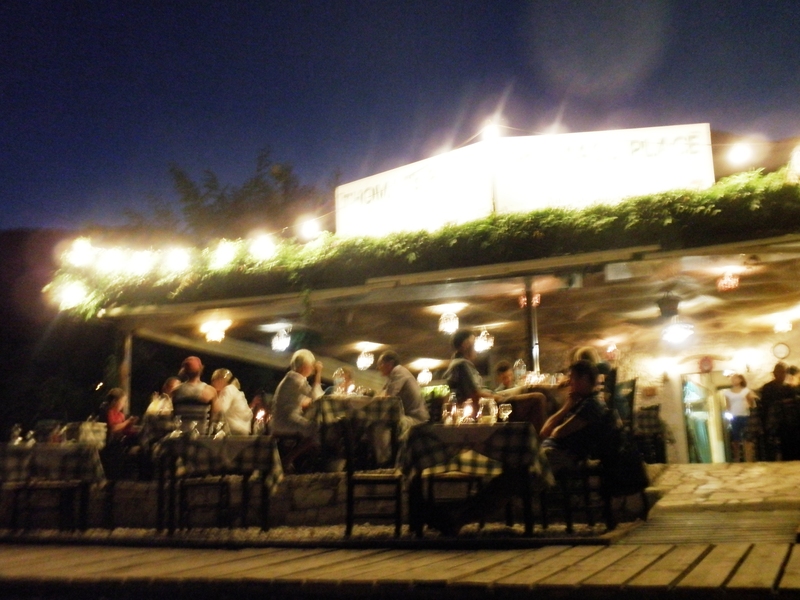 Sadly the Boss Bar in Santorini closed down sometime between 2004 and 2006 and so I needed to find a suitable alternative and decided upon the village of Kalami on the island of Corfu which we had enjoyed a couple of years previously. 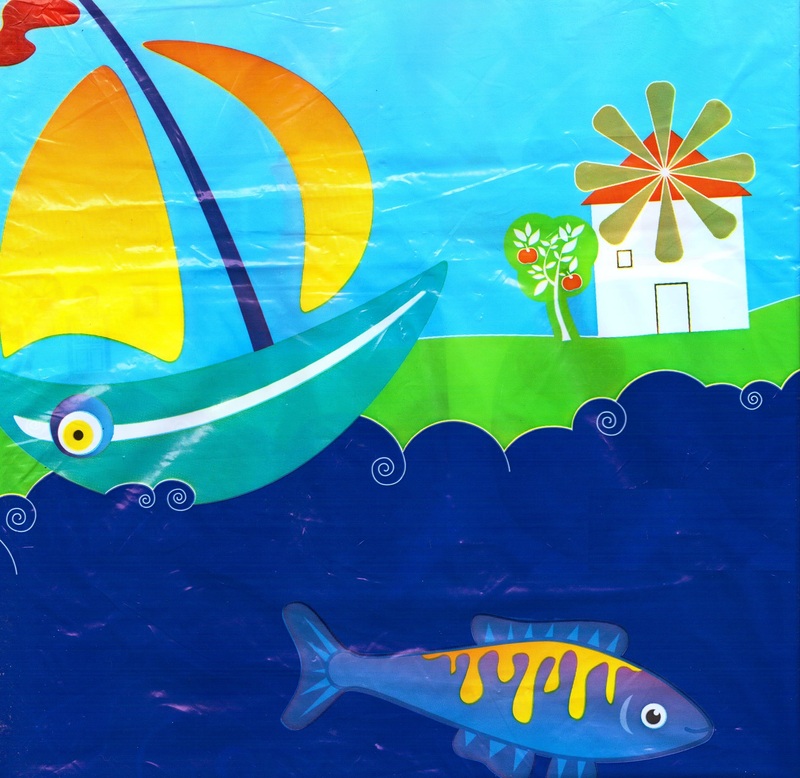 The end of the Summer usually means the Greek Islands for our travels but this year we were breaking with tradition and although close by to the Dodecanese we were visiting mainland Turkey instead. At the end of the holiday I drew up a balance sheet of our visit to Turkey. 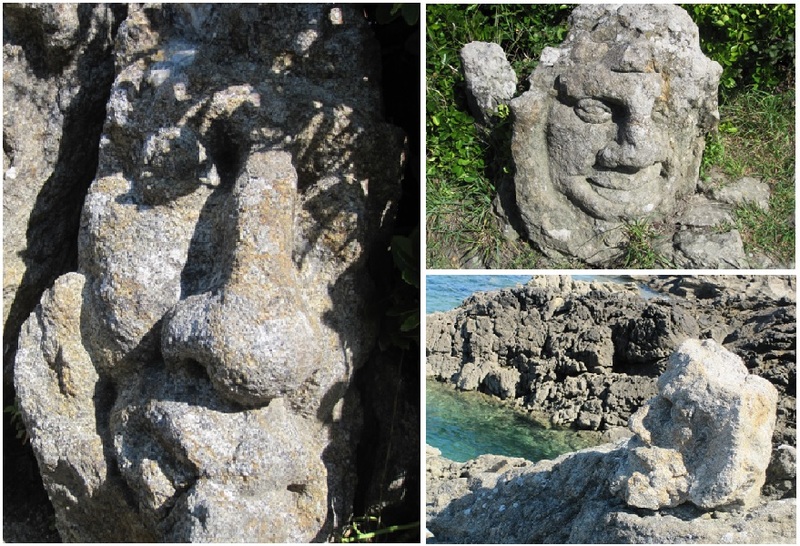 I had enjoyed the antiquity and the ruins, the temples and the ancient cities; the long walks along the coast; the friendly people; Bodrum; our excellent apartment courtesy of our friends Steve and Kath and the weather. On the other side of the balance sheet was the dogs, the litter and IMX Travel but overall I declared the holiday a resounding success and look forward to returning to Turkey as soon as the travel itinerary allows. 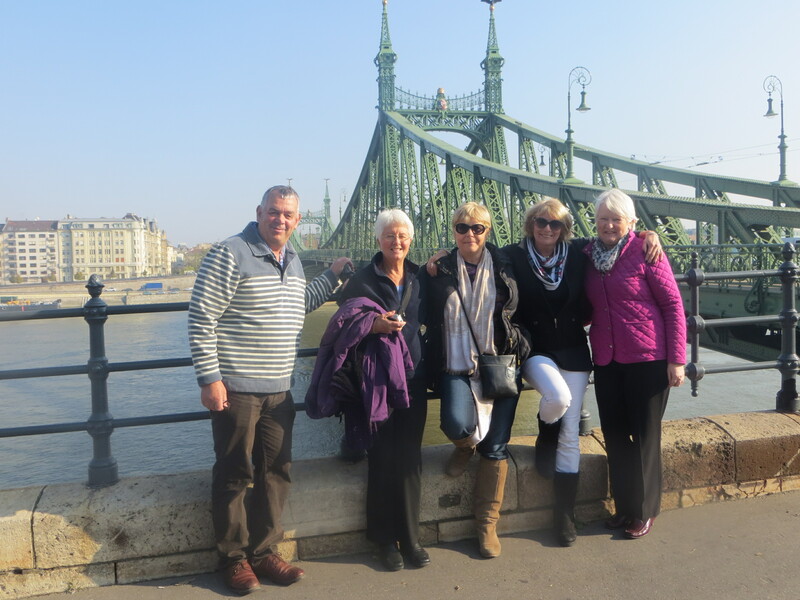 At the end of the year we travelled with friends to Hungary and its capital city Budapest. We had been before in 2007 but only for a couple of days which wasn’t nearly enough time to see the sights of this magnificent city so had no objections to going back for a second time. Budapest was an absolute revelation, I had not been expecting anything so grand, it was easily as good as Vienna and in my opinion much better than Prague, the scale of the city eclipses Bratislava and Ljubljana and I liked it as well as any other city I have visited. 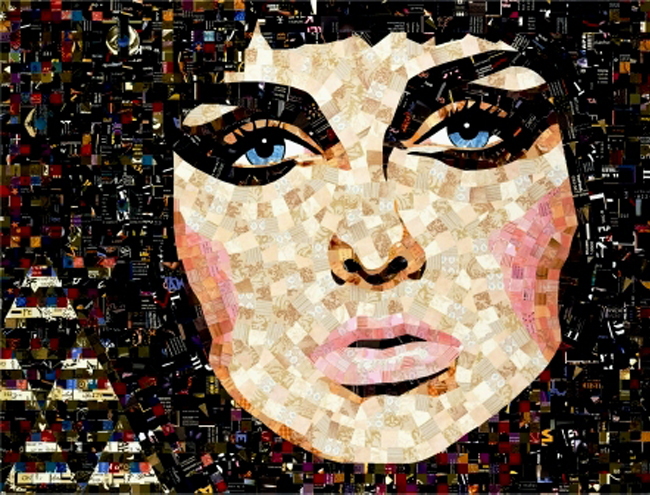 2014 has not been our most prolific travelling year – that was in 2007 when we managed to get away somewhere twelve times, once every month. Airline tickets were cheaper then and we didn’t have grandchildren so I doubt we will doing that again soon. Just six overseas trips this year and oddly, although I often say that I won’t go to the same place twice this year half of our travels were to places that we had enjoyed previously – Sigüenza, Corfu and Budapest and I think we will try and avoid repeat visits in the future if we can. After a long day in the car no one said a great deal but I am fairly certain everyone was pleased to be back in Sigüenza. It was late afternoon and the sun was still shining so we did the obvious thing and walked to the bar on the Plaza Mayor and ordered some beers. As the memory of the pointless journey began to slip into instant obscurity and as we sat and chatted amongst ourselves I looked around the Plaza and paid more attention to the details. The colonnaded façade of the Town Hall, the weathered stone symbols over the doors – the heraldic emblems of previous owners, the street signs, the metal railings and the stonework of the tall cathedral as it began to cast its shadow as the sun shifted position in the sky. 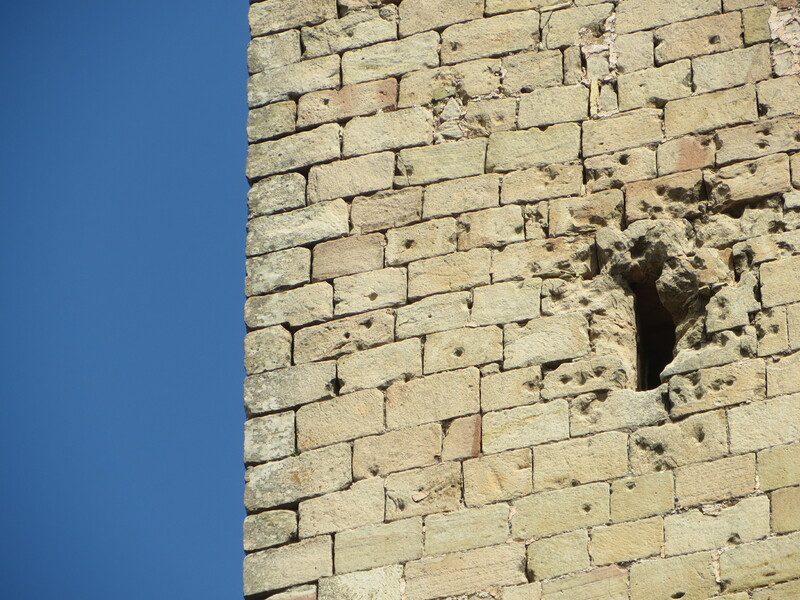 We were sitting close to the South Tower which reaches into the blue and has small-fortress like windows at regular intervals and the description fortress-like is rather appropriate because they bear the marks of shell damage inflicted on the building in 1936 during the Spanish Civil War. The Battle of Sigüenza took place from 7th August 1936 to 15th October 1936 and although it seemed difficult to imagine this peaceful and languid afternoon there was heavy fighting here then. 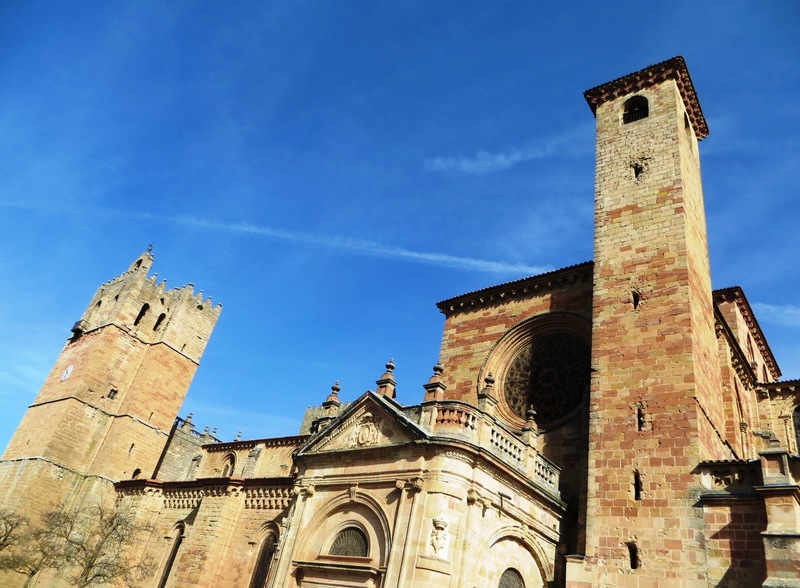 Sigüenza occupied an important strategic geographical position in a narrow valley on the main road and railway line between Madrid and Aragon and Catalonia. This is not a surprise, the Romans, the Moors and the Catholic Monarchs of the Reconquista had all previously fortified this place. Early in the conflict the town had fallen under the control of the Nationalist insurgents but was liberated by Republican loyalists in late July and the town came under the control of the left-wing extremist ‘Workers’ Party of Marxist Unification’ or POUM (a Trotskyisk organisation allied to the Left Opposition in Moscow against Stalin) and the Anarchist elements of the Republican army who were a dangerous and incendiary mix of discontented and revolutionary trade-unionists, communists and anti-clerics. 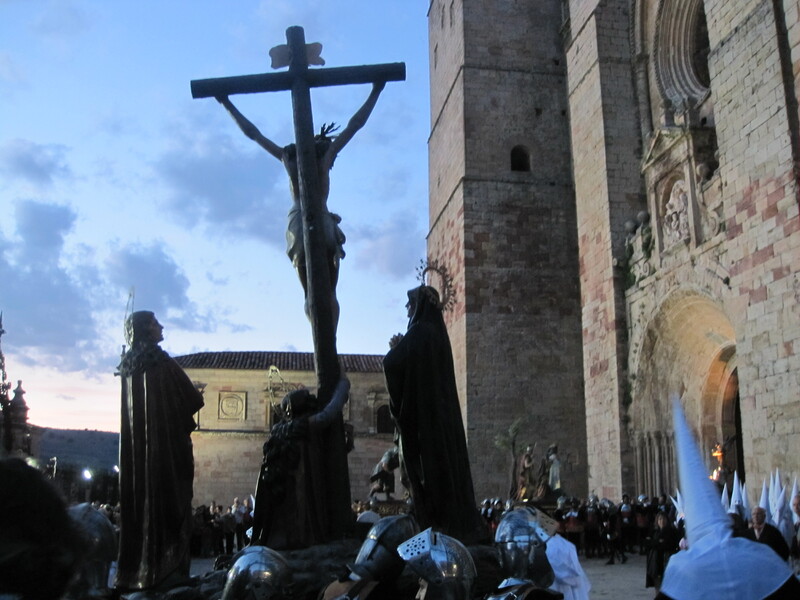 Sigüenza now became a victim of the ‘Red Terror’ which was a period of Republican atrocities during the Civil War including the killing of tens of thousands of people including many members of the Catholic clergy and the desecration, burning and looting of monasteries and churches. 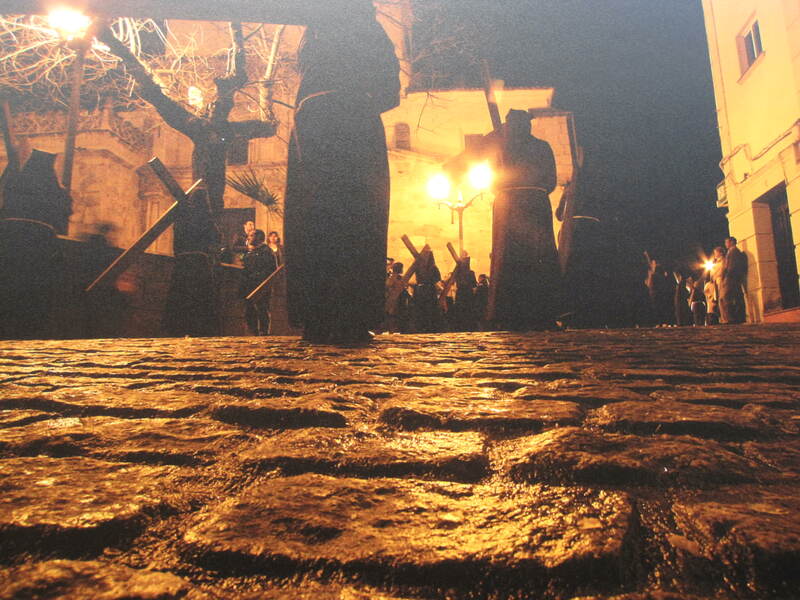 After taking control of the town Republican forces turned their anger against the religious hierarchy and structures, they celebrated their success with a blasphemous procession through the streets and then set fire to the Cathedral of Santa Maria. During the Civil War twelve Bishops were killed, the first was the seventy year old cleric in Sigüenza, murdered by firing squad along with the Dean and the Chancellor of the Diocese, their bodies burned and hastily buried a couple of kilometres outside the town and left to be discovered by advancing Nationalist troops. A further sixty or so people quickly suffered a similar fate. In September the Nationalist army was ready to attack as regulars and crack Foreign Legion troops manoeuvred into position, an air bombardment further damaged the cathedral and the town was completely surrounded. Reinforcements turned back because of bad weather and failed to arrive and the situation quickly became critical for the defending troops. Losses were high and eventually the three hundred surviving militiamen and four hundred civilians took refuge and fortified themselves in the Cathedral (I wonder at this point if they regretted burning it down?) They held out for a week as Franco’s superior forces overran the town but eventually were obliged to surrender, some of the militia tried to make a run for it but they were all gunned down trying to escape. 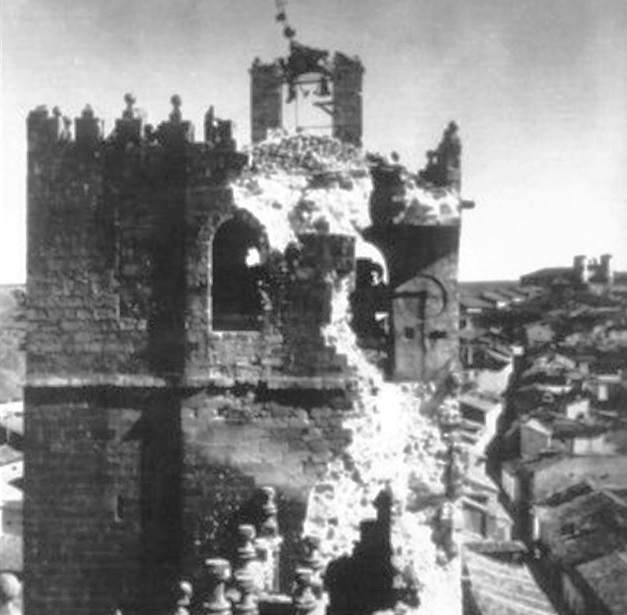 The Nationalists took control of the town but the Cathedral was almost completely destroyed by a combination of the vandalism of the Republican defenders and the ferocious bombardment of the Nationalist besiegers. It was rebuilt, repaired and restored in the 1940s. All of this was of course in complete contrast to the serene atmosphere of the late afternoon as families sat together in conversation, young lovers walked hand in hand and visitors stopped every so often to point a camera and eventually the sun began to dip and we finished our second drink and then left and made our way back to the hotel because we hadn’t left ourselves long to change and get ready to come back out again to watch the Semana Santa parade which I previously posted about here. 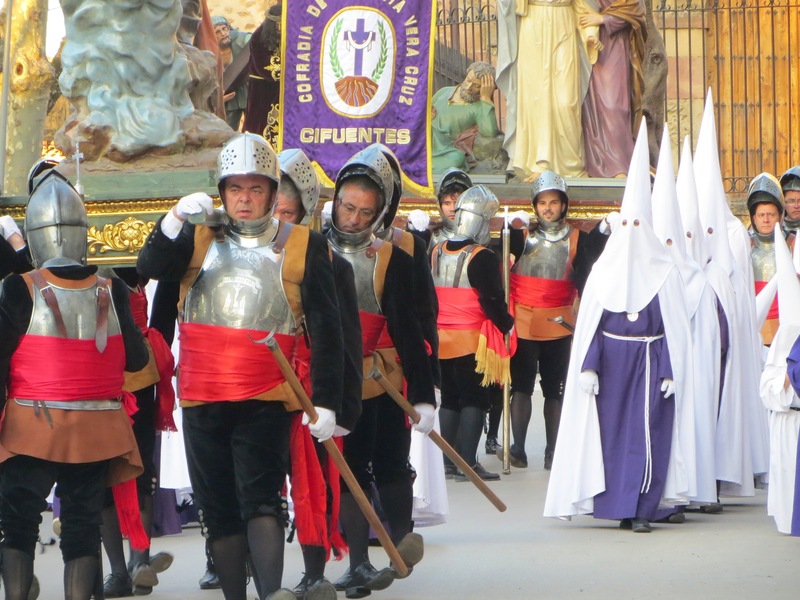 The Semana Santa is one of the most important traditional events of the Spanish Catholic year; it is celebrated in the week leading up to Easter and features a procession of Pasos which are floats of lifelike wooden sculptures of individual scenes of the events of the Passion. 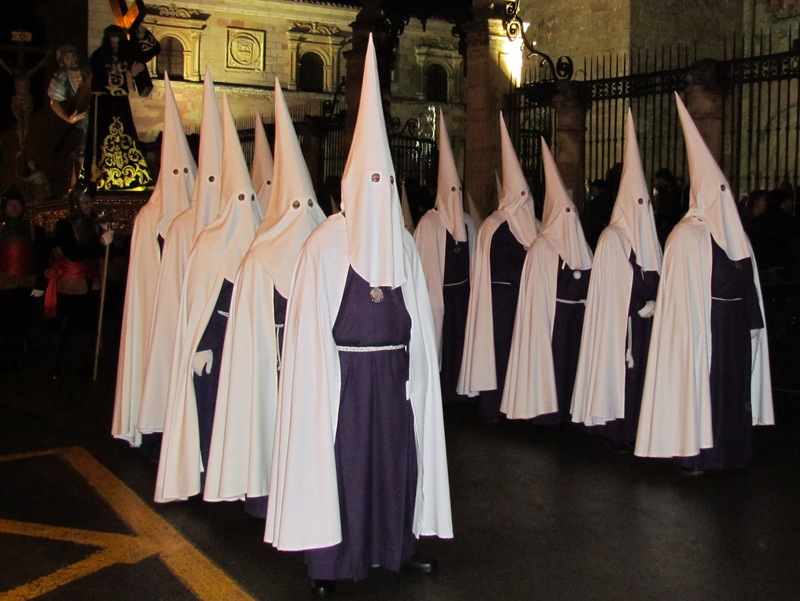 At the heart of Semana Santa are the brotherhoods, associations of Catholic laypersons organized for the purpose of performing public acts of religious observance and to perform public penance. They organise the street parades and also undertake many other self-regulated religious activities, charitable and community work. The theatrical display of pageantry and celebration moved slowly along a straight flat road but soon turned left and had to tackle a long energy sapping climb up a steep street that led to the cathedral and required ever more frequent stops. 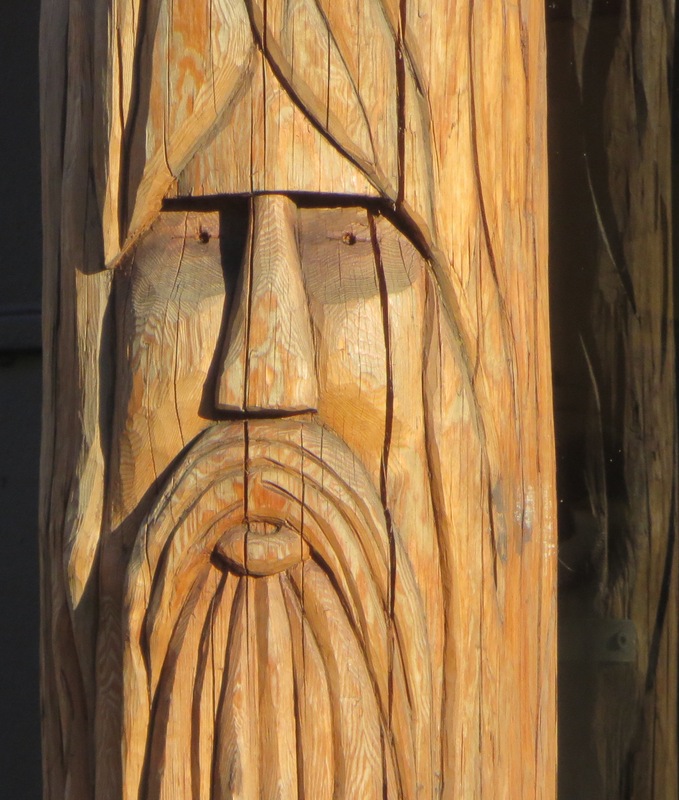 Each time the float carriers set the structure down on their stout wooden poles, breathed a well deserved sigh of relief and took a few moments to recover their composure. 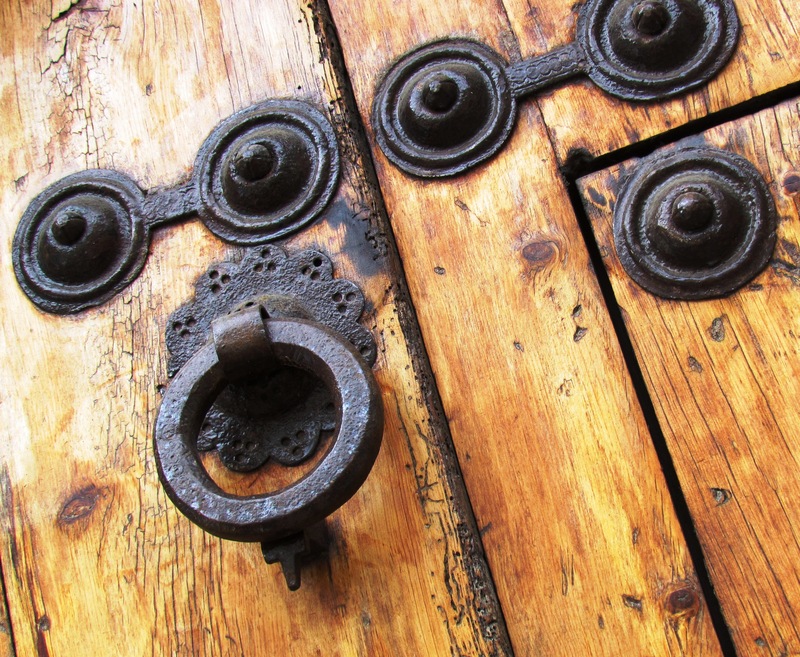 One thing was certain – these things were heavy – very heavy indeed. Eventually some clever person in command (clever because he was not carrying the heavy lump on his shoulders) tapped a pole on the ground which meant resume carrying position and then tapped it a second time which meant commence walking. The magnificently presented sculptures were punctuated with bands of drummers who beat out a steady pulsing rhythm in time with the marching of the men in military uniform carrying the pasos and then the penitents in silken gowns of pristine white and occasionally purple flowing around their ankles and they all marched, sometimes shuffled, slowly and in sombre fashion to the top of the hill and eventually to the cathedral square where one-by-one each of the floats were taken inside the main doors and manoeuvred carefully into position on top of the church pews.